The LBJ Depiction: fast and loose with many historical ‘facts,’ but the ends justify the means. 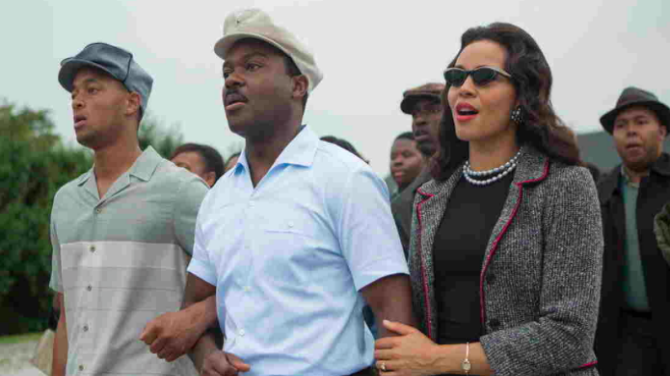 Keeping the Black in the Black Freedom Struggle: the ‘white savior’ theme is unavoidable—but challenged; the historians’ age-old dilemma between power and agency is here—but maybe only by accident. Intra-movement Tensions: Valiant focus made possible by the above point, but SNCC is an unfortunate and ill-formed prop; consensus carries the day. “IOU”: The Uptown Truman College mural, in its deep winter (2013). MIT professor of urban studies Larry Vale recently published a book that deals with what he terms, “twice-cleared” places. A prominent example he employs is the site of the Cabrini-Green housing projects in Chicago. There, a mixed race low-income and working-class community was cleared in the mid-20th century. After a generation of mass public housing, the iconic—if not infamous—Cabrini-Green towers were then razed as part of the city’s landmark demolition of concentrated projects. Upon this second clearance, officials directed the construction of lower-density mixed income housing, a Target, etc, etc. As Vale shows, twice-cleared areas represent complicated, layered social and cultural productions of space. In Chicago’s Uptown neighborhood—the city’s perpetual ‘next big thing’ neighborhood—there are an increasing number of twice (and thrice, and more) cleared spaces. The current iteration of ‘can’t miss’ redevelopment in Uptown centers around the $203 million renovation of the CTA Wilson Red Line station. After several years of planning, budgeting, and community feedback, demolition has finally begun. Among the first structures to meet the wrecking ball was a CTA viaduct wall that had borne witness to a contentious clearance of space one generation earlier. This wall hosted a mural painted in direct response to the clearance of a low-income area in favor of a city community college. The mural became faded and obscured by plant growth. Its sun-bleached, mournful, almost seething message could only be seen during the winter. Now demolished, the mural is only a memory, a fitting parallel to the challenge of preserving the history of displacement in Uptown. The killing of Michael Brown by a Ferguson, Missouri police officer, and the resulting community reaction, has put police brutality protest in the spotlight. The mass marches, limited looting, and confrontations with aggressive or ‘militarized’ law enforcement that typified the Ferguson protests seem like a relic of an earlier age. Many have been quick to draw parallels to Harlem (1964), Watts (1965), Detroit (1967), and Camden (1971), among others. I would like to add one more historical note, pulled from a chapter that I just so happen to be drafting this month. My case involves several similarities to Ferguson, but it is remarkable mainly because of a difference. The August 12, 1966, Summerdale March in Uptown Chicago was almost exclusively white. An uncommon density of vacant low-rent housing in Chicago’s Uptown neighborhood and a postwar job crisis at home attracted tens-of-thousands of working-class and poor whites from Appalachia and the south through 1970. By 1960, many considered Uptown the nation’s foremost “Hillbilly Ghetto,” even though the area’s low-income community also consisted of American Indians, non-southern whites, a smattering of African Americans, and a growing Latino population. Uptown’s postwar southerness has been ‘discovered’ time after time by various segments of the dominant culture: urban renewal advocates, social workers, sociologists, psychologists, anthropologists, country music radio executives, the New Left, sisters religious, the War on Poverty, and on and on up through…urban historians. When the SDS created the Economic Research and Action Program (ERAP) in 1964 to work towards an interracial solution to urban poverty, Uptown was a natural choice for one of the early projects. By 1966, SDS members were clamoring to be part of the Uptown ERAP effort known as Jobs or Income Now (JOIN). Noted organizers like Rennie Davis, Richard Rothstein, Vivian Leburg Rothstein, Todd Gitlin, and Casey Hayden lived in Uptown, undertaking the slow and uneven process of pushing locals towards political action. Early successes included a sit-in at the city welfare office, and tenant strikes that resulted in contracts between collectivized renters and landlords. These efforts antagonized most of the local political and social elites. The notorious “Red Squad” of the Chicago Police Department quickly placed JOIN under surveillance, and soon relied upon information from a local JOIN member who had become disgruntled with the outside activists’ “Unamerican” opinions about increased involvement in Vietnam. A law student soon infiltrated JOIN on the CPD’s behalf. Meanwhile, patrolmen from the local precinct prosecuted an aggressive policing of Uptown low-income teenagers and young people. When outside JOIN organizers—operating under the banner of “participatory democracy”—sought to create political consciousness around the grievances expressed by locals, police brutality came to the fore. JOIN leaders were mostly unprepared and unwilling to base organizing around the issue, preferring instead to confront economic injustices and the shortcomings of the local War on Poverty “Urban Progress” program. Yet anger simmered, most notably with the politicization of the “Uptown Goodfellows,” a street organization of southern and Appalachian tough guys. The Goodfellows took cues from similar black and Latino groups that were beginning to evolve from gangs into political units. The public historians assembled here in sunny Monterey spent their first day and a half covering what has become familiar yet still challenging ground for those of us in the profession. In round-tables, poster sessions, panel sessions, and working groups, they swapped insights on the cultural work that goes into interpreting an increasingly inclusive past to a likewise increasingly diverse public. The sessions I have attended include those about museum exhibits “co-created” with community members, the latest in attempts to interpret slavery at historic sites, my own working group about innovative reuse of “less-than-charismatic” structures, and sustaining public history though community engagement. Implicit in all these topics is the internalized impact of social history and the commitment to embracing marginalized voices—-both historical and contemporary. I actually feel that this laudable aspect of public history has become a little too familiar for practitioners, maybe even sometimes taken for granted. I’m certain that the social and even activist history ethic undergirds the projects highlighted thus far in Monterey. But I still crave even more forceful, direct, and critical expressions of public history work as ‘on a mission,’ for lack of better phrase. So imagine how surprised I was to read that, according to the New York Times, museums have generally gone too far in exploring diverse, contested, and contradictory themes. Edward Rothstein’s “New Insights into History May Skew the Big Picture” deserves a much fuller take-down than I care to provide at this time (and I hope that many of us currently here in Monterey will get home, unpack, and take up that very task). But suffice to say Rothstein’s synthesis of gripes about major exhibits is vague, myopic, and intellectually sloppy. The closest he comes to coherently expressing his critique is a passage that could have been ripped from a disgruntled letter to the editor circa 1995 circa Smithsonian circa Enola Gay exhibit. This mixture of new insight accompanied by new simplifications has become familiar elsewhere as well. The transformation of history that began in the 1960s (inspired by the American political left), took decades to have full impact on museums, but its perspectives have now become commonplace. Museums, in their traditional roles, were almost mythological institutions claiming to display the origins and themes of a society, shaping understandings with a coherent interpretation of the past. That model has now been remade with the singular replaced by the plural, coherence displaced by multiplicity. 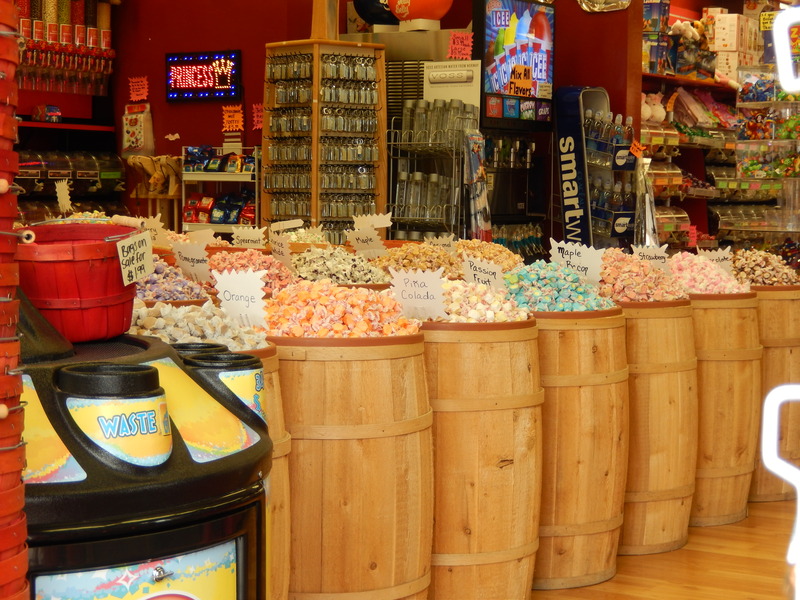 Colorful varieties of taffy at Monterey’s Candyland. Or to some a distracting diversity in ironic need of revision. There’s a lot to unpack from that paragraph and from Rothstein’s subsequent expressions of dismay about the scourge of “identity museums” (he seems to have a particular disdain for the Smithsonian National Museum of the American Indian). For example, Rothstein should be reminded that those hoary “almost mythological institutions” of yesteryear were as much “identity museums” as the NMAI or any other such place. It’s just that the identity promoted then was elite and white. And then there’s his alarm at the way that the National Archives dares to call to attention to the fact that the nation’s past (and, gasp, present) has failed to live up to its lofty ideals. William Ippen co-facilitates the working group “Innovative Reuse in the Post-Industrial City,” and with the NCPH Task Force on Public History and Environmental Sustainability will discuss the group’s white paper. Stay tuned to The Lakefront Historian for frequent blog posts from these–and maybe more–historians, about their Monterey experiences. 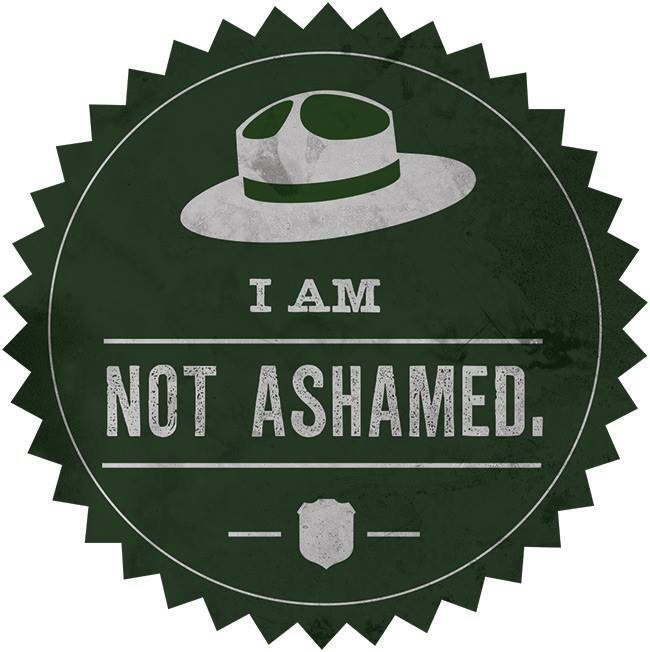 An unexpected media and political discourse has emerged as the Federal government nears a second week of being ‘shutdown.’ Access to sites under the watch of the National Park Service (NPS) became a political football. The conversation started almost simultaneous to the actual shutdown, when a squad of octo- and nonagenarian Mississippians stormed the barricades of the World War II Memorial in the middle of the National Mall. An irresistible media story, for certain. Politicians–as they do–seized on the spectacle. The next day a GOP Congressman berated an NPS ranger charged with manning the barricades, in truly a pathetic display even for Washington politics. NPS closures became highly visible, with signs, barriers, and traffic cones juxtaposed against heritage sites and natural treasures. GOP congressmen offered the President a “compromise” that would have reopened the NPS sites while budget talks continued. President Obama turned down the proposal, and his rivals immediately attempted to seize the moral high ground. Some pundits ran with the idea that preventing access to “open-air monuments” was unconscionable, if not outright illegal. Section 106 handouts from the CTA. In this day and age, a link to their PowerPoint deck would have been nice. Anyone with the least amount of training or education related to the management of historical resources knows the importance of Section 106 of the National Historic Preservation Act (1966). Section 106 is deceptively complicated and vague, resulting in negotiations between preservation ideals, community desires, and economic development. As public history graduate students, we are well-versed in the letter and spirit of Section 106. But rarely do we have the opportunity to observe the process in all its messy and contentious glory. 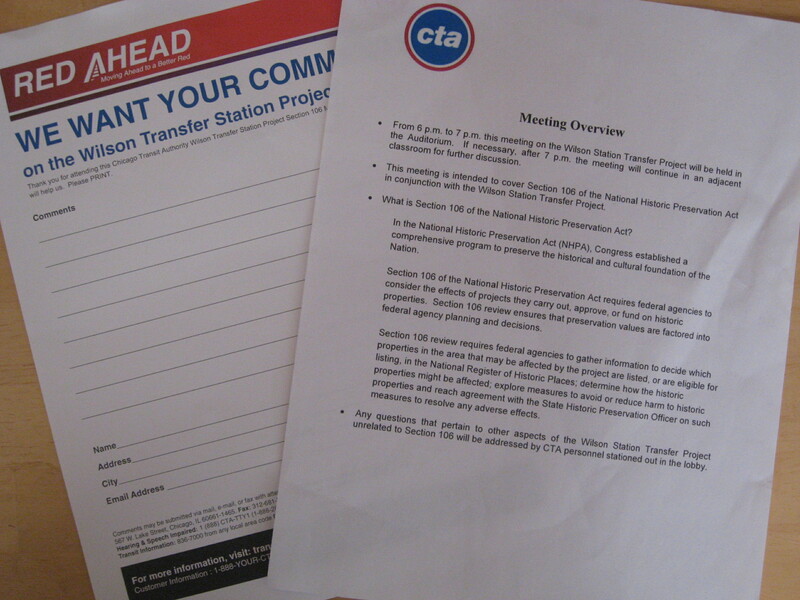 Recently I attended a Section 106 public hearing related to the $203 million reconstruction of the Chicago Transit Authority’s (CTA) Wilson Station. The Wilson Station project is using tens of millions of dollars from the Federal Transit Administration (FTA), and sits in the Uptown Square Historic district—-thus triggering the 106 process. Uptown is a neighborhood well-versed in community political participation, and has long served host to very diverse expectations of development, preservation, and economic and political justice (Hey, someone should write a dissertation about that). The CTA, FTA, the alderman’s office, and the City of Chicago have an enormous stake in the project that is deemed a necessary infrastructure upgrade and an essential key to the eternally-incipient ‘revival’ of Uptown. These factors, combined with the minimalist and impressionistic nature of Section 106 itself, promised to make for an interesting evening. This initial 106 meeting lived up to my expectations.